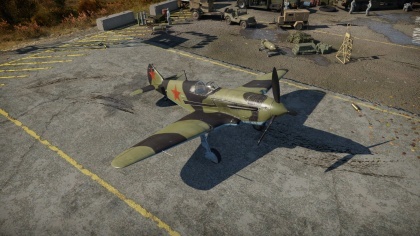 The LaGG-3-11 is a Rank I Russian fighter with a battle rating of 2.3 (AB) and 2.0 (RB/SB). 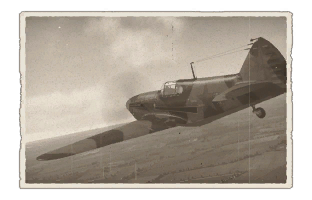 This aircraft was introduced in Update 1.33. Like the other LaGG-3 models, the 3-11 has the advantage of an extremely low BR and cannon armament. The top speed is comparatively high when put against planes such as the P-36 or Ki-43. The climb rate is also quite good, attributed to the high max. speed an acceleration. However, the turn rate and elevator are extremely poor. Energy fighting is a must when it comes to the LaGG-3. Since the LaGG-3 has cannon armament, a 2-4 second burst is all that is needed to shred an enemy plane. Use Ground Target belts for the best effect with both the Shvak and Berezin UB. Poor handling at high speeds. Average horizontal handling, poor vertical handling. Low ammo count with Berezin UB MG.
Wings tend to snap when turning against biplanes. This page was last edited on 12 January 2019, at 03:05.